Many moons ago, when I was still just a screenwriter, I had a meeting to talk about TV shows with a writer-producer named Lin Oliver who, it turned out, had something of a passion for children's books. So did I! Cool. Up until then, I'd never heard the un-pronouncable acronym SCBWI - which stood for the Society of Children's Book Writers and Illustrators, an organization that, it turns out, Lin and Stephen Mooser had started - but Lin convinced me it was a good thing. I joined SCBWI, pronounced it letter-by-letter, and have been a member ever since. It took over a year before I decided to actually do anything with that membership. Since I live in Los Angeles, I figured it would be easy for me to start with the little summer conference thing they put on here. Holy overwhelming motherlode of children's book wonderfulness! I walked in to that first conference not really knowing a soul there. I walked out being part of a tribe. At that very first conference, I met the man who would become my editor, Arthur A. Levine. He thought the t-shirt I was wearing was funny and offered me a deal on the spot! Nah. That's a fib. But I did get to talk with him and decided that I'd like to work with him (as did about 973 of what I believe were 974 attendees there. No comments about number 974, please). I also learned incredible amounts about children's literature from gifted speakers, fellow attendees, and, well, everyone I met. And I could go on for hours with stories of great (fanboy!) conversations (with Lee Bennett Hopkins! Sid Fleischman! ), but I'll (Ashley Bryan! Linda Sue Park!) spare you. At an SCBWI-Orange County Editors' Day, Rachel Griffiths, then working with Arthur but now at Scholastic Press, mentioned me from stage! No, it was not for a book deal, but rather for my rejection of her rejection letter. Still, she later found me in the crowd and told me that she and Arthur wanted me to stop with the picture books and write a novel already. I was flattered... though, of course, I had just come up with a great picture book idea. In 2006, this blog went viral and into the New York Times (more on that soon, by the way). I ended up getting a book deal, and yes, it was with Arthur... for what became The 14 Fibs of Gregory K., a novel that is, as they say, hot off the presses. The deal... this book... the ability to write this book... I don't think any of it would've happened without SCBWI. For that I'm incredibly grateful. But you know what I'm even more grateful for? The tribe. In the years before and since my deal, it has been the people I've met in SCBWI - at local, regional and national events - who have sustained me, taught me, advised me, and given so generously of ideas and support. I kid you not when I say that because of SCBWI, I have hundreds of friends I never would've had... and they are great people. When I try to describe my SCBWI experience to folks in different lines of work... they understand it intellectually, but have no point of reference for it emotionally. Maybe it's because we all share a passion for and understanding of the power of what we do - after all, how many of us were touched by, empowered by, intrigued by, shaped by, or saved by books as a kid? Or maybe we just happen to all be really nice and smart and fun, too. Probably, it's a bit of both. Whatever the reasons, though, I'll take it. So thanks Lin and Steve, everyone in the main office, and all the volunteers that keep SCBWI going strong. I'm so grateful to be part of the tribe... and I look forward to celebrating children's literature with y'all for years to come. 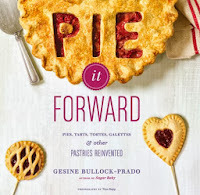 I'm calling it Pietry Friday here at GottaBook since I'm talking to author and baker Gesine Bullock-Prado, and we're talking all about pie! 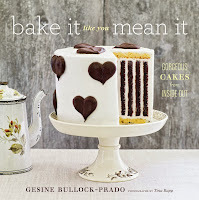 I have to tell you that I spent farrrrr too long looking at Gesine's cookbooks and the pictures she's posted online as I was preparing this post. Her work is so gorgeous - I consider it poetry on a plate - that it was everything I could do not to take fork and knife to my screen. I can't do the food or her justice in this small post, so I urge you to check out Gesine's blog and books as soon as you're done here. Or earlier, if you need a fix! 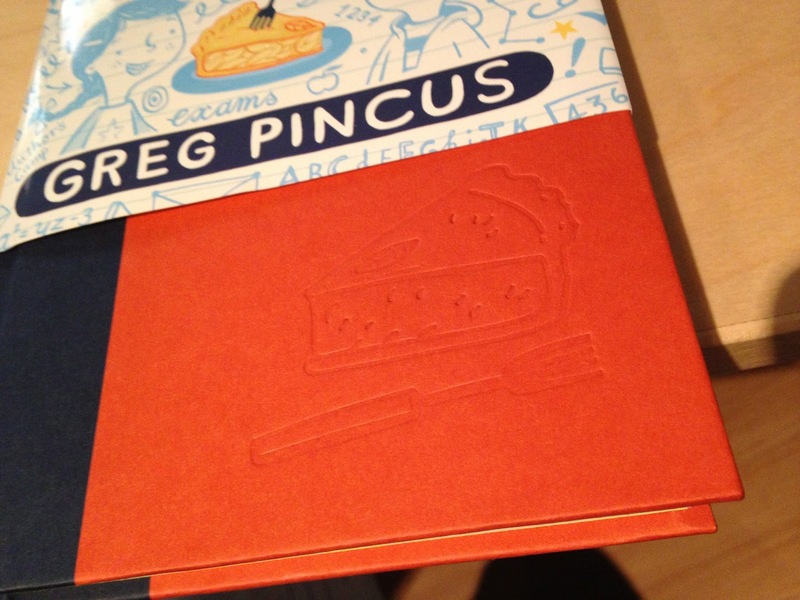 Was it later experiences that led you to devote a whole cookbook to the sweet and savory joy of piedom? Or was pie a major part of your childhood? No. Not in the American sense. But I did have tarts galore in the German/Austrian style which are just pies under another name. It wasn't until I grew up that I was able to dive into the splendiferous world of pie, American style. The double crusteds, the creams. The mile highs and the crumbles. I love them all. You make the most gorgeous looking food. Is there anything, pie or not, that sticks out in your head as gorgeous and actually bake-able by, say, someone with my limited skills? Absolutely. I suggest starting with a simple free form pie, one that doesn't even require a pie pan. And with a simple blueberry filling that only requires you to do a little tossing and coating, you'll have a delicious pie in no time. Do you have a favorite pie or pie recipe? I'm partial to cream pies. Chocolate cream in particular. With a puff pastry crust, a little chocolate ganache coating the crust and then light and airy chocolate cream in the middle, nothing better. Is it important to know the difference between a crisp, a crumble, a brown betty, and a cobbler? I know you do some classes, and I see you on TV and all that... but what can we look for coming up? 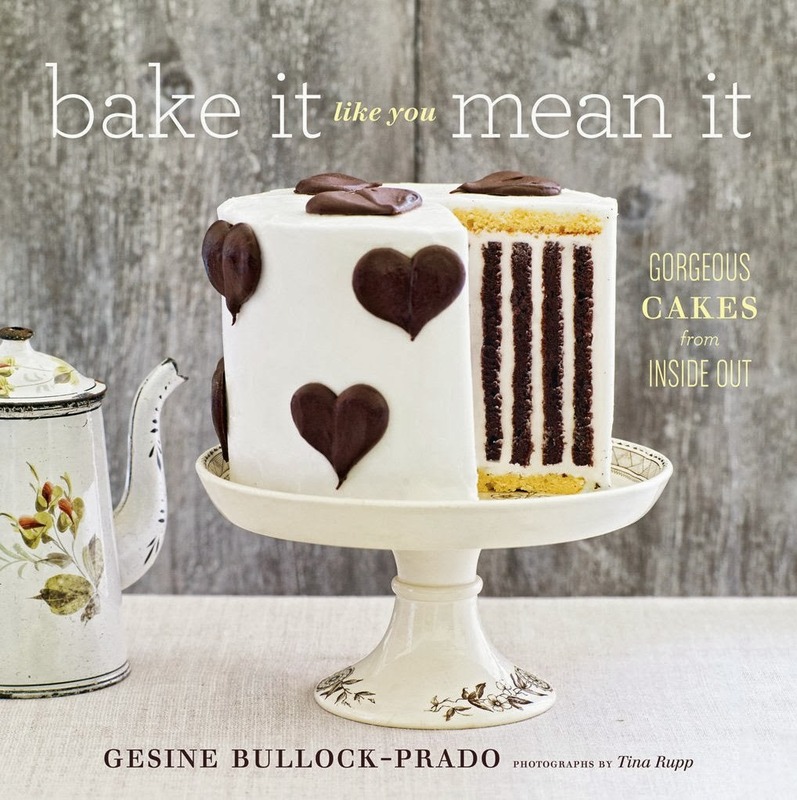 A book for the go to baker who's required to have all kinds of tricks in his or her baking quiver, from decadent treats, to gluten-free, to dairy & egg free to healthy. I'll have options for everyone. 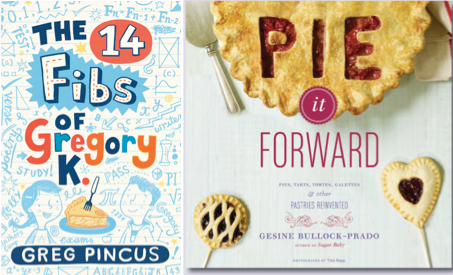 Don't forget to enter for a chance to win Gesine's Pie it Forward and my own 14 Fibs of Gregory K.! The 14 Fibs of Gregory K. is out now (yay!!! ), so I've decided to celebrate with a double giveaway: a copy of The 14 Fibs AND, since pie is a big part of the 14 Fibs, a copy of Gesine Bullock-Prado's amazing cookbook Pie it Forward. We'll both sign/personalize our respective books to whoever wins 'em - you can have them both made out to you, or the cookbook to a child you love and 14 Fibs to you... or vice versa. If you don't know Gesine's work... oh, geez. I mean, following her on Facebook or reading her blog means that, if you're like me, you'll whimper in longing as you marvel at the beauty of baked goods then swoon with the idea that you could actually make such things. I'll have a convo with Gesine here tomorrow (and more pictures! ), but now... the giveaway! 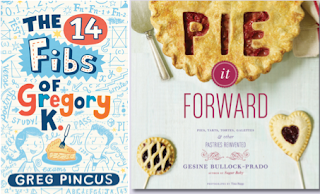 For your chance to win the books, leave a comment on this post - ideally mentioning your favorite kind of pie, just for fun. No multiple entries, please. Due to logistics and laws, entrants must be U.S. residents 18 or over. Void where prohibited, too. Entries will be accepted until midnight Pacific time on Thursday, October 3rd. I will then use random.org to pick a winner (odds of winning are based on the number of comments not your favorite pie type). Please make sure that the way you comment allows me to get in touch with you - if you are "anonymous" or have no contact info available, it will be very hard to collect your prize. And with that... enjoy some pie and enter away! 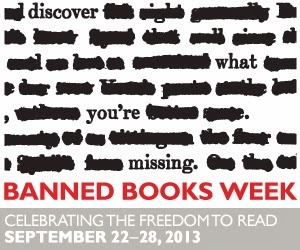 Over the years, I've read so many books that have been banned... and oftentimes, I never even knew it. What often astounds me is how many of those books I've read aloud to rooms full of kids and never once had a complaint nor, to be honest in some cases, could I imagine why I'd get a complaint. Yet raise issues people do (as is their right, by the way). That's why it's important to know what to do when it happens - because it's always a "when" not an "if". So, as Banned Books Week begins, check out the ALA's page of resources and information and be prepared. And me? As I've said before, I'm with the banned. One day you'll have your day. 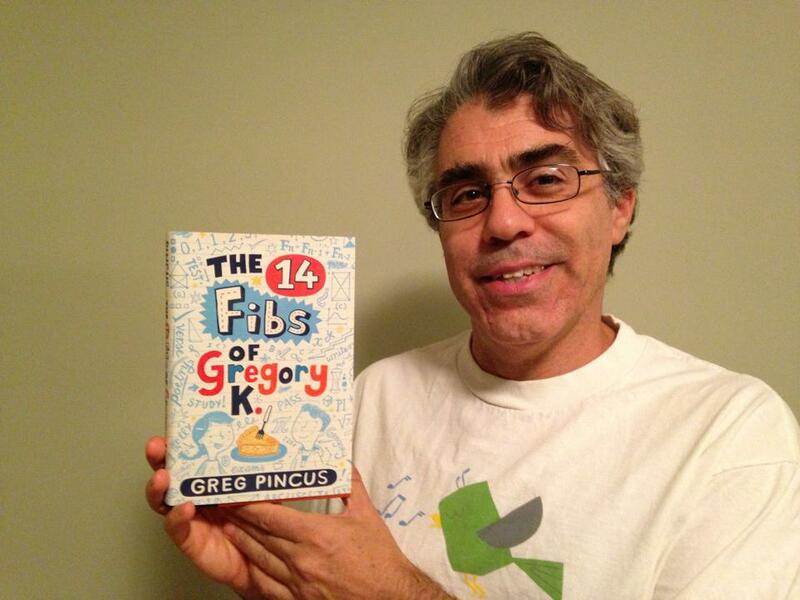 It's the 14 Fibs of Gregory K.
And they all love math. A girl in his class. And she's always kicking him the calves. To keep him from the things he might blunder. You're getting through sixth grade in most creative ways. If you haven't actually HEARD the song, take a listen in the trailer embedded below. I am biased, but I think it's just happy-making. I have always found song lyrics and poetry closely related, so I figured for this Poetry Friday, I'd share the former for a change. Happy-making, I tell you! Well, at least for me :-) I'll share more about Andrew/the song process another day. If you've never heard his music, though, don't wait for that post. Go listen to him now. Today's Poetry Friday roundup will be over at The Opposite of Indifference. Will there be other lyrics? Go check and see! 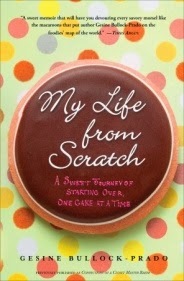 I promise you I won't post links or outtakes to every review or interview or the like as I launch my book. Honest. Still, now that it's available to read online, I figure I can point you to the Kirkus Review review of the 14 Fibs of Gregory K. And yup, the title of this post is the last sentence of that review. By the way... it looks like 14 Fibs comes out next week on the 24th! This book on anti-gravity will never make you frown. In fact, the only problem is you just can't put it down. What's that you say? I'm not allowed a groaner (with science that is not 100% perfect, I suppose)? Of course I am! It might be the only one that's part of this week's Poetry Friday roundup (hosted over at Teach Mentor Texts), but you'll only know if you go check it out. If you want to get all the poems hereabouts (and only the poems) emailed to you for freeee as they hit the blog, enter your email address in the box below then click subscribe! So. Uh. My first ever copy of the hardcover, actual book of The 14 Fibs of Gregory K. arrived the other day. There was additional squeeing. And then, as I figure all authors do, I explored the book. Thing of beauty it is! And look. LOOK!!! On the book itself... there is pie! It's engraved right in there. Isn't it delicious looking? Nina Goffi did the design of the book for Scholastic, and seriously... the little details from cover to cover, inside and out, really make the whole experience better than it would be with just my words. Huzzahs to her, I say. Huzzahs! I read two dozen comic books. Three graphic novels, too. I understood the signs so wasn't eaten at the zoo! I read aloud each billboard as we drove on our vacation. The packages our food comes in? I read their information. I figured out which films to watch by reading their descriptions. I read a lot of magazines (and got a few subscriptions). I learned the rules of four new games by reading the instructions. I devoured five new joke books (though I skipped the introductions). I read the list of all the things I can't do at the pool. I even read the packet labeled "Welcome Back to School." 'Cuz I didn't crack a cover of my summer reading books! Ah, yes... summer reading. You know... let's not talk about that - let's talk instead about the fact that the Poetry Friday roundup is up over at Author Amok today! The roundup is purely happy stuff (as is, I've always believed, the very name Author Amok), so head on over and get your fill o' poetry goodies. And if you want to get all the poems hereabouts (and only the poems) emailed to you for freeee as they hit the blog, enter your email address in the box below then click subscribe! 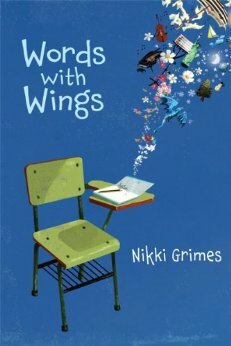 It is always cause for celebration when Nikki Grimes has a new book out... and she does now with Words for Wings. So, yeah, I'm celebrating. But more than that, I'm saying you really oughta check it out - it is, in her typical fashion, awesome. This is a novel of poems - compact, emotional, funny, expressive poems - telling the story of daydreamer... and maybe writer?!?!... Gabby. It's hard not to root for Gabby, a character who we learn about through her own words. Suffice to say, I'd love to see more books about her. Now, what struck me personally is how Words with Wings shares a few strong themes with my own book coming out - a kid who writes and a teacher who makes a difference. Maybe this is why it struck such a chord with me? Maybe. But I think it's honestly that the story is so well handled and so enjoyable that it couldn't help but strike a chord with me. Have you read it? I'm curious what you think! 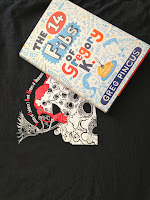 I'm lying if I tell you I'm not excited about the fact that The 14 Fibs of Gregory K. is coming out sooooooooon (let's call it October 1, shall we?). I mean, yeah, I am excited. Like a lot. And so much fun stuff is gonna happen here and elsewhere in the weeks ahead - more blogging, new poems, a song for you, video(s), guests here at Gottabook who I want you to meet, perhaps even me elsewhere on other blogs, and, of course, surprises. Most of all, I hope - fun. And I am just so happy I get to share this stuff with y'all - you're like family, you know? In a good way, naturally! I wish I could have a party wherever you live. Maybe some day. Still, for my LA area friends, here's a wee tease of something for sure: the afternoon of October 19 at the fab Flintridge Bookstore & Coffeehouse. PARTY! OK, that's not really a tease, but it's not my formal announcement, either, I guess. Or it is. Just come if you can (and look for details soon). I'll also be talking about ways you can get a signed book no matter where you live, figuring out ways to celebrate virtually, and, yes... MORE!